I always used the term depreciated, but according to Wikipedia it’s deprecated. It’s not trying to say it’s lost it’s value; it’s trying to say you’re discouraged from using it. In computer terms it generally means something that has been replaced by something better/newer, but it’s still kept around for backwards compatibility. 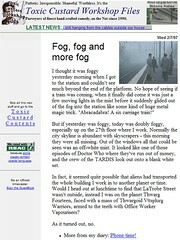 I officially launched toxiccustard.com on 2nd December 1996. It followed on from the Toxic Custard email list that was started back at uni in 1990, about four web sites hosted in various places by some kind mailing list readers who offered space on their servers. Actually from time to time I still encounter people who read the Toxic Custard list back in the 90s, and have found themselves scarred by the experience. Over the years a bunch of other stuff got posted onto the site. Highlights included all the Shakespeare spoofs, the video destruction, the Doctor Who spoof and my History of the World. But my blog has taken over most of my online content creation time, and in March 2005 I moved the blog over to danielbowen.com. I’ve tried to find the time to keep updating toxiccustard.com, but other things have occupied me. I’m arguably less attached to some of the content there too… as I get older, some of it seems increasingly… well, immature. Just revisited the vcr destruction. Still a good laugh. Totally irrelevant but I am curious as to how the solar hot water is performing now that you have had it while? Maybe worth a post. Sorry for the pedantry (hey, I’m a librarian), but deprecate and depreciate are two completely different words. I think you’ve depreciated your earlier postings – but I think you probably underestimate their value. It’s all important, in my view; a nice snapshot of a growing phenomenon. Cherish it. Vlado, there’s still a few of you around. I recently discovered a guy at work used to read it 15+ years ago. Frank, fair point. But yes, I’m keeping it all. Hate to say it but Wikipedia is edited by general people and they actually discourage students using it at high school in getting there info, as it can be simply wrong or inaccurate, more the latter. Totally surprised that you use it at all Daniel or even refer back to it. Sure, even I’ve contributed to Wikipedia on occasions. But studies have shown overall it’s no less accurate than paid reference works. As I’ve blogged before, I guess the bottom line is to have your BS detector running, and always double-check anything important with another source. then I found it again a few years later and have been on the list ever since…. Yes, became a blog lurker after following you here Daniel from the Toxiccustard mailing list – found in a newsgroup originally (I think it might have aus.culture too, vlado). It’s still worth a look – I contributed a great vomit, myself.